Your passion can help raise funds to support our campers! 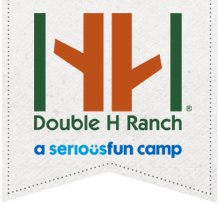 Each year, the Double H Ranch provides specialized programs and year-round support for over 2,100 children and family members dealing with life-threatening illnesses. All programs are provided free of charge to our campers and their families. Whether you participate in road races or want to donate your birthday, you can turn your hobby into a fundraising campaign to support the Double H Ranch. Special Occasions: Start a Wedding Registry Campaign or donate your birthday! Endurance: Race, bike or run to support Double H Ranch! Get Creative: The possibilities are endless. We’re excited to see what you’ll come up with! Build your Page – Click the “Start Fundraising” button below! Set your fundraising goal, personalize your page and let the world know why you’re passionate about the Double H Ranch. Ask for Support – E-mail your page to your family, friends, classmates and co-workers and ask them to donate. You’re making a difference – You are changing lives with the money you raise! Questions? Please contact TJ Roode, Development Coordinator, at 518-696-5676 x269 or e-mail tjroode@doublehranch.org.